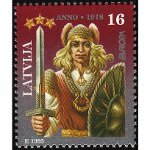 Lāčplēsis Day (Lāčplēša Diena) is a Latvian remembrance day observed on November 11. It commemorates the victory of the Latvian Army over the West Russian Volunteer Army led by Pavel Bermondt-Avalov in 1919. On November 11, many countries celebrated Armistice Day that commemorates the end of the First World War. Latvia is not one of them; on this day, Latvians celebrate one of the most important victories during the Latvian War of Independence. In 1919, Russian military officer Pavel Bermondt-Avalov formed the so-called West Russian Volunteer Army. It was supported and in fact created by Germany. In October 1919, Bermondt's army attacked Latvia and attempted to proclaim the Western Central Government in Riga. On November 11, the Latvian Army liberated Riga with the help of the Estonians and drove Bermondt forces into Lithuanian territory. The anniversary of victory was designated as a remembrance day. It was named Lāčplēsis Day after the legendary hero Lāčplēsis. On Lāčplēsis Day, Latvians light thousands of candles across the country. In Riga, people light the candles at Riga Castle on the banks of the Daugava river. The holiday is also marked with parades, processions and wreath-laying ceremonies at monuments to freedom fighters.